Creating an online presence for your company is no longer just invaluable and relevant, it has become absolutely necessary for success. A website may be the very first impression a potential customer has with your company or organisation, and so it is paramount that it is presented in a professional and clean light. By doing so, you are essentially establishing trust with your target audience, and helping to build a positive first impression. Are you considering creating a new website for your business? There are generally two options here. You can either purchase a pre-built template, or have one specially built for your business’ needs, creating a bespoke identity that your users can recognise you by. 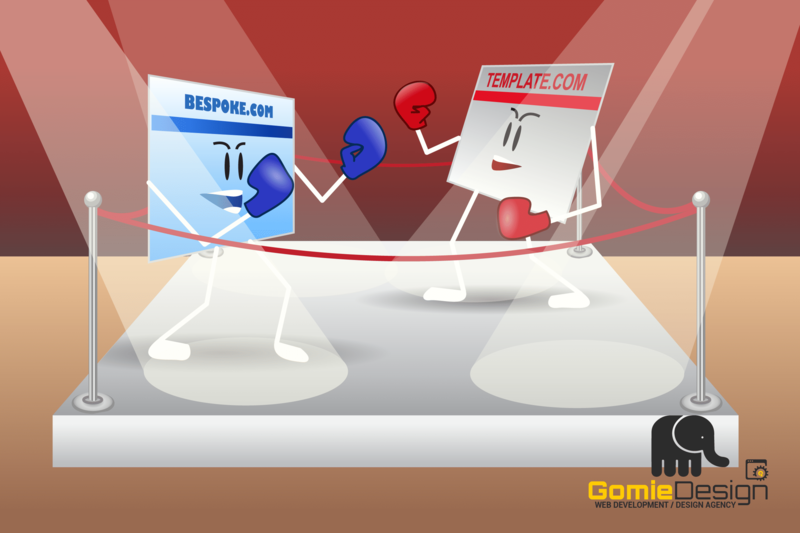 Both of these options have their pros and cons, and so we at Gomie Design have taken the time to talk you through both, helping establish which is the right choice for your business. A ‘template’ website is a pre-built site that’s available for anyone to buy. The owner of the company can choose from numerous pre-designed templates, then tweak the colour, text and images to suit the brand. This can either be done by supplying the developer with content, or by using an in-built Content Management System (CMS). However, these pre-built websites can sometimes be quite limited, and generally not very flexible when it comes to the design. Whilst template websites are relatively cheap to purchase, there are a few drawbacks to using them for a business. Overall, customisation of a template website can be limited, ultimately making the process of creating your brand and identity online a difficult process. Plus, if the functionality of the layout isn’t right for the site, you can then be compromising on your users’ overall experience, sometimes driving them to go elsewhere. A ‘bespoke’ website is a tailor-made site which specifically meets the demands of your business. Once you’ve chosen a bespoke website, a designer will spend time analysing your brand, seeking out its requirements and interpreting your preferences into their work. This allows the identity of the business to be consistent throughout the site, and will ultimately offer your users a positive experience whilst visiting your website. If you opt for a bespoke website, you are guaranteed to have complete control over what you want to convey to potential customers/users. Bespoke websites are built using the very latest W3C HTML and CSS coding standards, guaranteed to get the best result for your business. The designer will take time to ensure that website works well with different browsers and screen sizes, ensuring that your design looks good to every user. A bespoke website will also offer you the ability to further expand your online presence, with developments seamlessly being incorporated without hassle or fuss. Whilst a bespoke website is costlier than a template design, you are sure to have access to a wealth of experience, advice and information through your designer. Whereas, a template website can sometimes be limited when it comes to this. This is just one of the things that you will be investing in when you pay a little more for a bespoke site. Even though a template website can save you a few pennies, a bespoke design has invaluable benefits for the future of your business. It is sometimes worth considering a bespoke website over a template option so that you don’t run the risk of compromising on quality, usability and professionalism. In the end, you do really get what you’ve paid for/invested in. Are you looking for a company website that stands out from the crowd and gifts the best online experience to your users? If you are, be sure to contact the Gomie Design team today. With a team of professionals paired with competitive pricing, we will be sure to cater to your web design needs.